2 Beds 3 Baths 1,309 Sq. 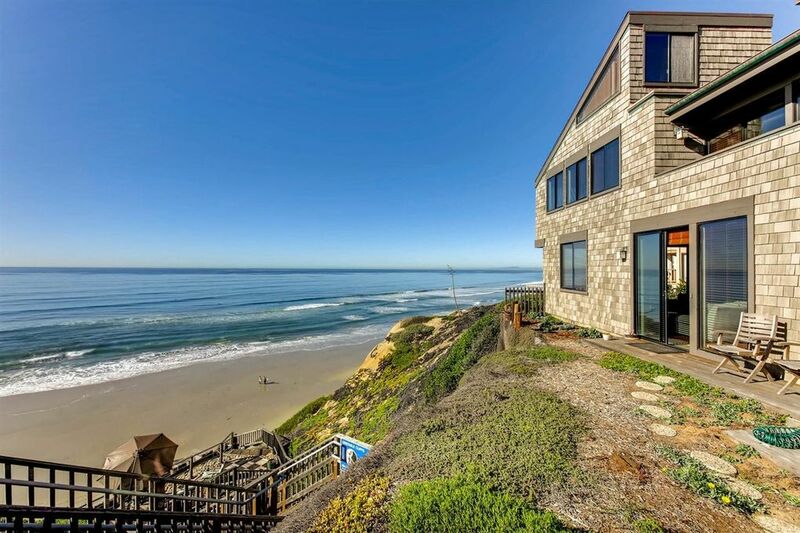 ft.
RARE Opportunity to own one of the best located OCEAN VIEW properties on the bluff! Perhaps the most oceanviews from any bluff unit with views from every room! This End unit townhome, sharing only one wall with No one above or below you, sits out on a point with the most westerly location, captivating extreme privacy and expansive views of the pacific ocean. Recently remodeled with modern finishes and decor. Built out lofts in both bedrooms upstairs for extra sleeping quarters or storage. See supplement.. Outside of the dynamite location, This property remodel is top of the line and simply gorgeous. The first level has been transformed into a very open living area with a fireplace, complete with a remodeled kitchen, great room, updated powder room transformed into a full bathroom with shower, hardwood cherry floors, mahogany doors, wood beam ceilings, stainless steel counter-tops and appliances. Upstairs you will find 2 master bedrooms both with LOFTS and 2 full baths, newer carpet, and another deck off one bedroom. This gorgeous property has 2 underground parking spaces and is convenient to everything! Close to Del Mar Race Track, shops and restaurants.The private beach access is foot steps to the ocean and a redone landing half way down to the beach. One of very few gated, private complexes on the bluff with private beach access. Well maintained common areas with grassy greenbelts & and mature landscaping. New roofs & exterior siding have been redone in recent years.